The thing was... I couldn't find a project that felt exactly like what I wanted to do. I wasn't really interested in fully quilting these, or in attaching bias tape or ribbon, or in adding fleece lining or whatever. C'mon, this is make believe - dollies don't really need extra thermal layers, do they? But as I mentioned above, I also didn't want to just fold over a piece of cloth. 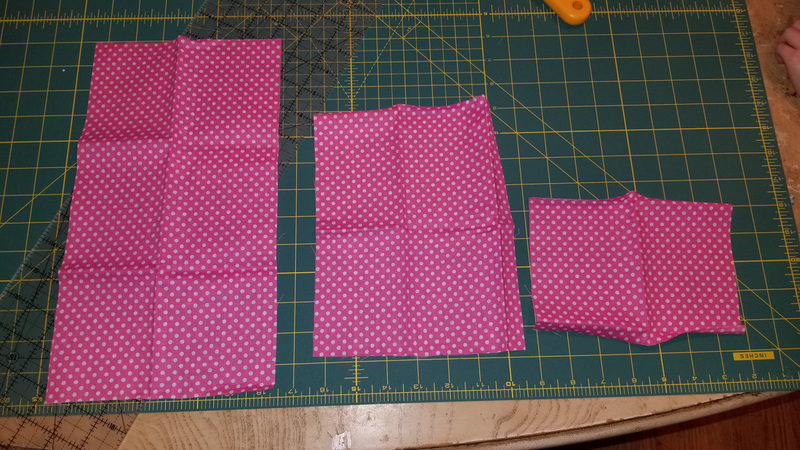 So I gave up, grabbed a Barbie doll and a couple of fat quarters of fabric, and started laying things out. My setup above has me spoiled. I have come to realize that I hate cutting fabric with scissors like some sort of peasant. No, please give me the luxury of using my rotary cutter, self healing mat (which my boys view as a truly magical item), and quilting ruler. My lines are always perfectly straight, and my cuts are always perfectly clean. Let's be honest - both of those items often elude me with scissors. I elected to go with strips that were seven inches wide, figuring that it would give the Barbie plenty of room. After laying her on the fabric and eyeballing about how much I wold need for her to lay on top of (with allowance for a pillow), as well as how far up the covering blanket should go, I ended up with one piece at twelve inches by seven inches, and the second at nine inches by seven inches. I then took one of my offal pieces to use for a pillow, and sized it down to an even five inches by seven inches. Fabric ready, in sizes of 12"x7", 9"x7", and 5"x7". 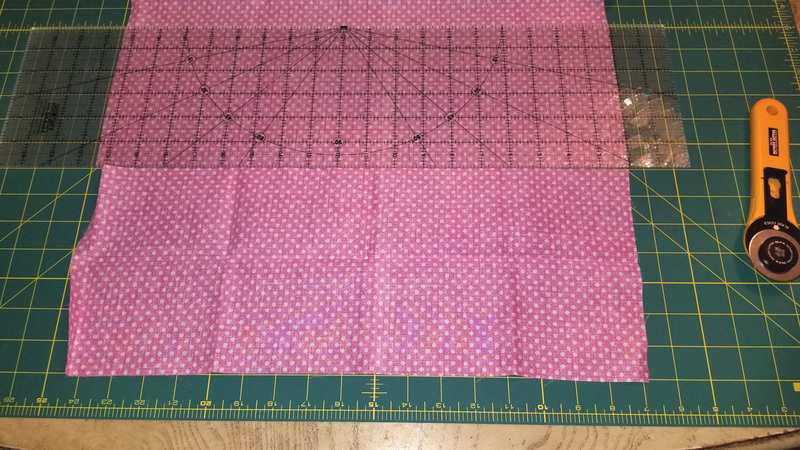 After ironing my pieces, the next step was to fold over a half inch on the end of the 9x7 "cover" and run a seam down it, then do the same for the longer backing piece. That would ensure that we always had a nice finished edge for the ends of our sleeping bag. I then pinned the two blanket pieces together, "right sides" touching. 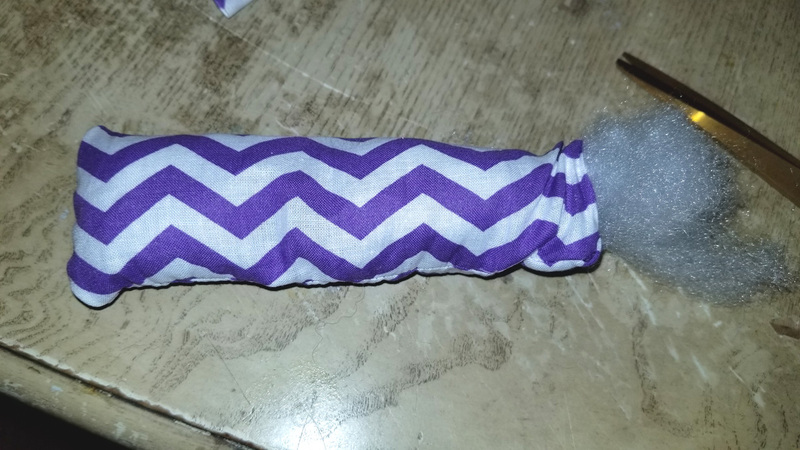 Next, I ran a seam around the three outside edges of the sleeping bag, then turned the fabric inside out - so that our "right sides" were now facing out. The two blanket pieces pinned together. The pillow was the next item. 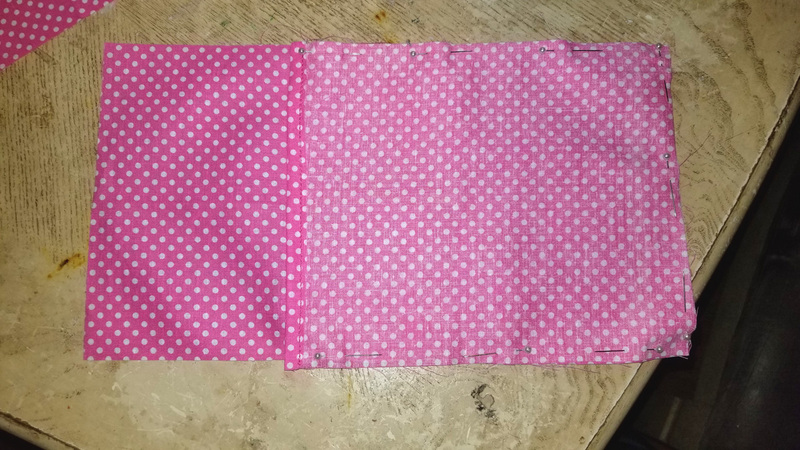 I folded the fabric in half "long ways", with the "right side" in. This gave me a long, narrow piece of cloth, which I seamed across the long opening and on one short opening. Yes, that fabric is different. 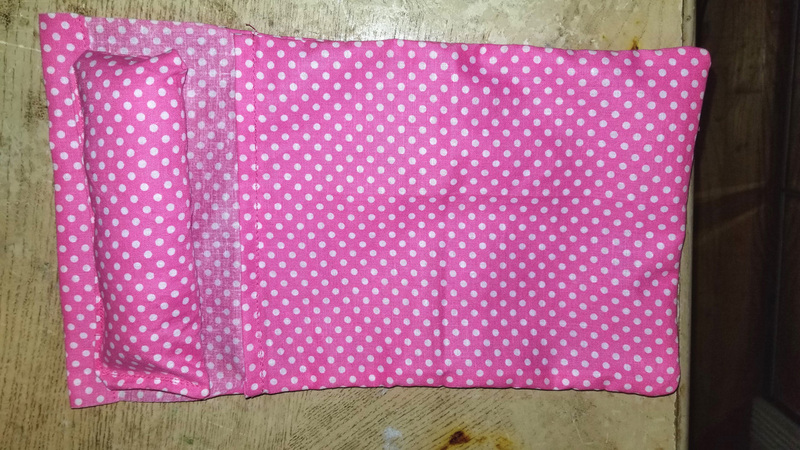 Yes, I forgot to take pictures of the pillow when I made the first sleeping bag. Yes, I decided to mix and match pictures. The pillow was then turned inside out and stuffed with a small amount of Poly-fil. 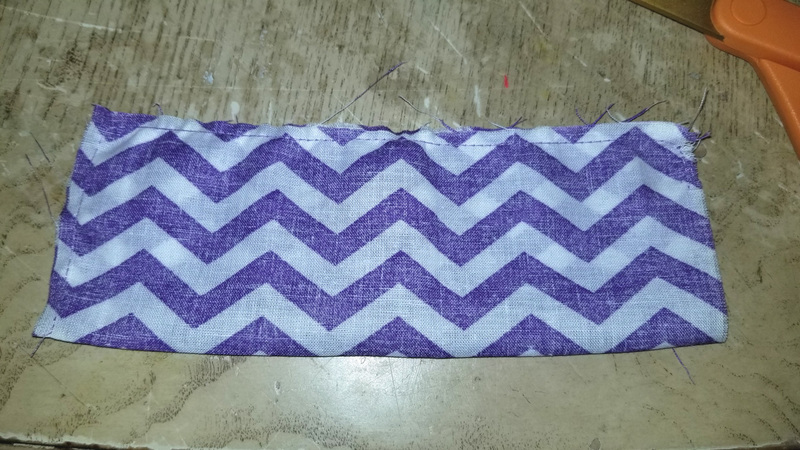 I'm sure that some would then use a hidden stitching technique, but I figured that my four and two year old daughters would truly not be concerned with seeing a few stitches, so I simply tucked the ragged edges of the opening in and ran a small seam to close it. One fully stuffed pillow, ready for closing. At this point, I had a final decision to make. Should I attach the pillow or leave it loose? If left loose, it would give the girls more flexibility to play, I suppose... but at the very real risk of losing the silly pillow altogether. I consulted Wynter, my four year old, and she sagely advised that I attach it to the sleeping bag. In retrospect, she was wiser than me; why did I even consider doing it otherwise? At any rate, I simply centered the pillow in the appropriate place for the doll's head - checking with an actual doll one more time, just to be sure - and stitched it down with my machine. 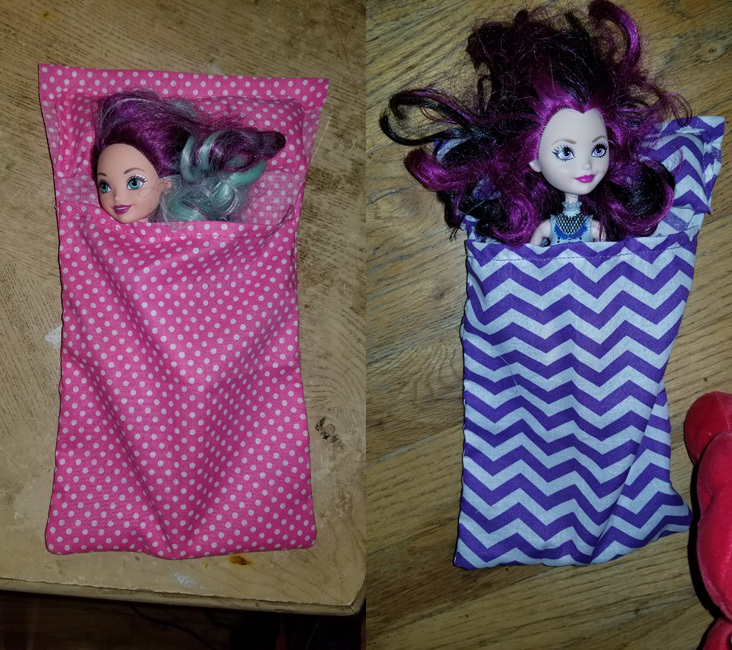 Voila, the Barbie sleeping bag was complete! Finally, Wynter was able to test out her sleeping bag - which she had been dying to do. The child had been hopping up and down beside me while I sewed, declaring over and over that she was "so excited"! Poor Elowyn (my two year old) had to wait for her sleeping bag, however... it was too late at night for me to start another. Fortunately, Wynter was good about sharing, and soon enough Elowyn got her purple bag. To call these "hugely popular" in my house would be an understatement. So far, it has mostly been Barbie, Disney princess dolls, or Ever After High dolls in them, though one stuffed puppy has found his way inside one, as well. Donna has informed me that I will without a doubt need to make more of these. The finished sleeping bags in action. All told, they take around an hour to make, though the second one was predictably faster than the first - and someone with actual sewing skill would likely breeze through these in no time flat.